The Parental Rights Foundation is grateful for those professionals and organizations who work to prevent child abuse and neglect. With them, we believe no one has a right to abuse or neglect a child. Yet we would also caution that the system designed to prevent abuse and neglect can sometimes become the worst offender. Every child abuse investigation involves intrusion into a child’s family and can have life-changing consequences. 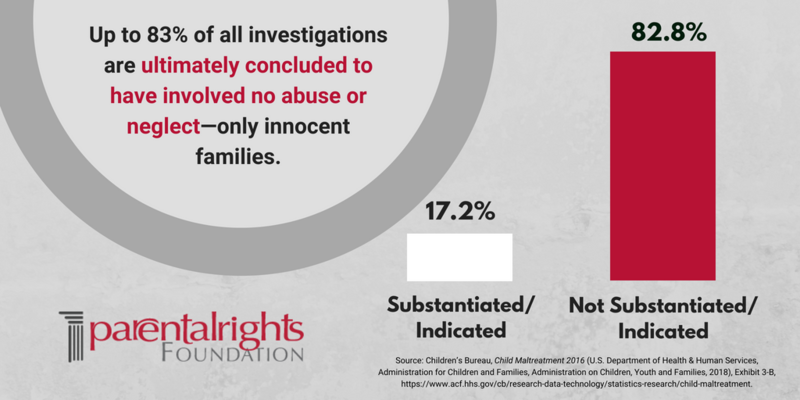 Yet, up to 83% of all investigations are ultimately concluded to have involved no abuse or neglect—only innocent families. This is also the point of the amicus brief which we filed recently in Doe v. Woodard. Children must be protected from abuse and neglect. But many more children can be spared unnecessary trauma if we can protect the rights of innocent parents to lead their own families and especially to not be separated from their children without serious cause. The best child welfare investigators know and understand this, too. They know the best place for a child is with the parent if that is at all possible, and that separation is seen as a last resort. This high respect for the role of the family and the rights of parents to act as their child’s first defense is the best way to protect all children not only from maltreatment at home, but from abusive intervention by the state. Children’s Bureau, Child Maltreatment 2016 (U.S. Department of Health & Human Services, Administration for Children and Families, Administration on Children, Youth and Families, 2018), https://www.acf.hhs.gov/cb/research-data-technology/statistics-research/child-maltreatment. Goldstein, Joseph, Anna Freud, and Albert Solnit, Before the Best Interest of the Child (New York: The Free Press, 1977), pp. 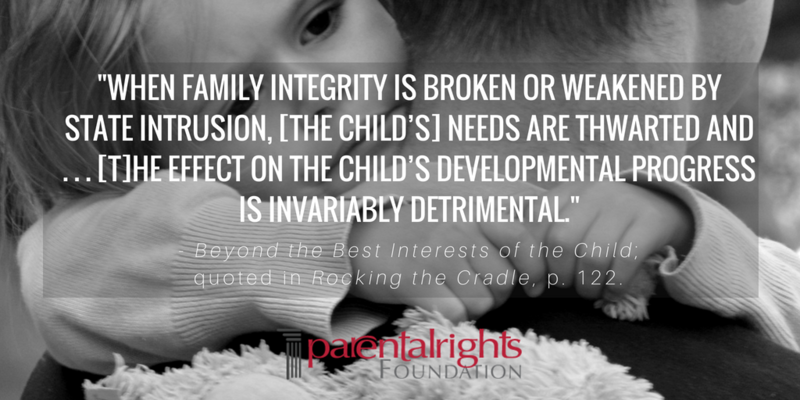 4-5: “We believe that a child’s need for continuity of care by autonomous parents requires acknowledging that parents should generally be entitled to raise their children as they think best, free of state interference. This conviction finds expression in our preference for minimum state intervention and prompts restraint in defining justifications for coercively intruding on family relationships….So long as a child is a member of a functioning family, his paramount interest lies in the preservation of his family.” Goldstein’s trilogy remains the gold standard for quality child welfare investigation guidelines. We have also included articles related to the success of other options besides removal and on how removals are impacting families. Termination of Parental Rights: What’s The Rush? - "If a parent is unfit and cannot care for his child, we should automatically terminate his parental rights. Right? Well, maybe not." 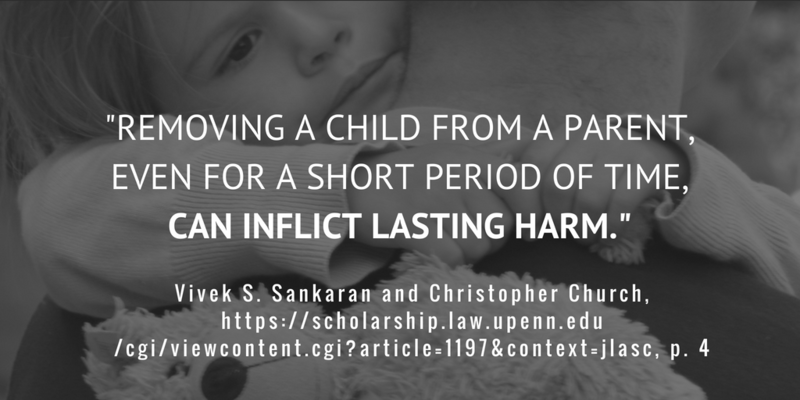 When Protection Hurts - This heart-felt blog post written by an attorney who works with both children and parents shines light on how painful removing children from their parents--especially emergency removals that are later shown to be unnecessary--can be. "I frequently recall one child who was asked to draw himself as a superhero. I asked him what his power would be, 'When I grow up, my superpower is going to be to keep families together,' he said. 'So no kid has to go through what I am going through right now.'" Foster Care vs. Keeping Families Together: The Definitive Studies - This article discusses several studies, including one by the University of Minnesota, that highlight the negative affect foster care can have. "These studies found thousands of children already in foster care who would have done better had child protection agencies not taken them away in the first place." "Children on the margin of placement are found to be two to three times more likely to enter the criminal justice system as adults if they were placed in foster care." 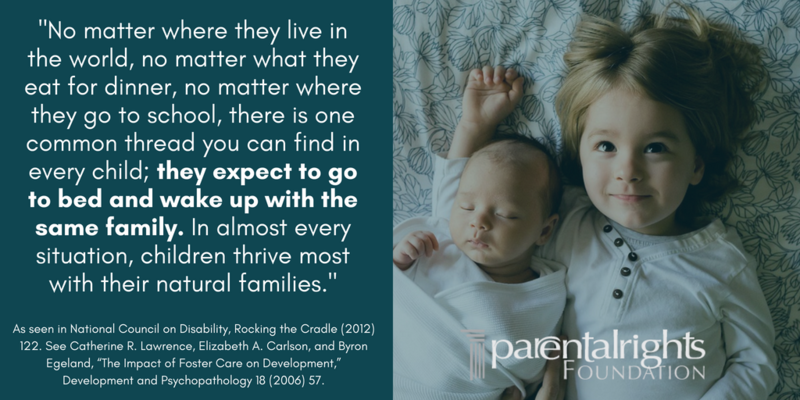 "...children on the margin of placement tend to have better outcomes when they remain at home, especially for older children." Children in Foster Care: Issues and Concerns - While this article is written for psychiatrists, it points out how much foster care children struggle even as adults. [T]he consequences of trauma exposure and the current realities of the broader systems of care leave them ill-equipped to engage in independent decision-making. These young adults are more likely to engage in behaviors that increase their odds of inpatient psychiatric care and criminal justice involvement. There are solutions out there that many haven't thought of to keep families together while getting parents the help they need. "Nonetheless, for many years in Berks County, new mothers like Kelly — fresh on the path of addiction recovery — had their newborns routinely taken away and put in foster care, often directly from the hospital, Chandler says." But there's good news. Some counties in Pennsylvania are trying a different approach that helps struggling mothers and allows them to safely keep their child with them. If all child services agencies worked like this there would be a lot less hurt and anger in the world. "These moms left their kids for a few minutes and got arrested. A scary look at our new moral vigilantism"
"Each year, about 3.4 million calls are made to these state-run phone lines. Tragically, only a fraction of these calls are made by trained professionals reporting actual abuse or neglect. The others are made, often anonymously, by people who don’t know what constitutes abuse (or, more nefariously, by those who want to punish the parent). But because child protective service agencies are required to act, these calls can result in innocent parents losing their kids, tangling families in a complicated system." Many people call Child Protective Services when they think there may be a problem with a child. What they don’t realize is there is a chance they are doing more harm than good to the child and its family.